The Italian Agusta plant was founded in 1907. Italian constructor Giovanni Agusta founded a company manufacturing aircraft of its own design. The Great World War interrupted the company's operations. The company was reactivated in 1923. The company adopted the new name Costruzioni Aeronautiche Agusta S.p.a. The plant was located in Samarate in Lombardy in the north of Italy. The most ambitious program of the company was the Agusta A8, a four-engine aircraft, designed to carry 26 passengers, among others. The aircraft made its first flight on June 9, 1958. The Agusta A.Z.8 is similar to the Douglas DC-4. The plant hasn’t won any orders. However, already in 1952, Agusta purchased the Bell 47 helicopter license. This decision influenced the change of the production profile. The cooperation of the Agusta and the Bell companies in many studies and programs is conducted to the present. Agusta helicopters have traditionally been marked with the letter "A" and a three-digit number. The first one was the A.101 helicopter, which takes 35 passengers on board. The company has been involved in the production of turbine engines for its products. In 1961, the Agusta purchased a license for another the Bella product, the Bell UH-1 Huey helicopter. In 1967, Agusta obtained licenses for the production of Sikorsky SH-3 Sea King helicopters, produced in several versions. Also in 1967, a Boeing CH-47 license was purchased. In 1971, the company built the most recognizable own helicopter designated A.109. In 1983, the first flight was made an assault helicopter marked Agusta A.129 Mangusta. In 1983, the Agusta factory took over the Italian aircraft manufacturer SIAI-Marchetti. From the beginning of the 80-year period Augusta's cooperation with the British company Westland Helicopters dates. The first joint project was the AgustaWestland AW.101 helicopter, which replaced the Sea King helicopter. Cooperation was also undertaken with other companies in Western Europe. In 1992, all these companies established a consortium NHIndustries, in which Agusta had its shares. The effect of the work was the NH1 NH90 helicopter. In 1998, the company together with the Bell Helicopter Textron established a joint venture known as the Bell / Agusta Aerospace Company. The product of this cooperation is a vertical take off and landing plane (VTOL), Bell / Agusta BA609, predecessor the V-22. In 2001, Agusta and British Westland Helicopters merged and a new AgustaWestland company was established, which has about 20% of the global helicopter market. About 20 types of helicopters have been created to perform various tasks. WSK PZL Świdnik searching for orders, in 1996 it concluded a contract with Agusta for the production of structural elements of Agusta A.109 helicopters in Świdnik (currently AgustaWestland AW.109). In Świdnik, the production of helicopter fuselages and tailpieces began. In 2006, a five hundred fuselages A.109 was delivered from Świdnik. In 2001, the cooperation was extended to a fuselage production for the Agusta A.119 Koala (currently AgustaWestland AW.119). Świdnik had a large share in the design and production of AgustaWestland AW.139. Since 2012, complete fuselages for the AW.139 model have been created in Świdnik. The A.109 helicopter is the only one of Agusta's own design. The prototype A.109 nb NC 7101 made the first flight on August 4, 1971. The RAI and FAA helicopters certificate was obtained on June 1, 1975. At the same time, the A.109 helicopter was allowed to fly according to devices with a one-man crew. A few months later, the A.109 helicopter obtained certificates: France, Canada, Germany, Sweden, Switzerland and the UK. The Agusta company offered the A.109 helicopter in the following versions: civilian, land forces, maritime aviation. The civilian version of the helicopter was offered as a fast VIP transport, as well as for state services: sanitary, police, border guards. The first serial helicopters were delivered to recipients at the beginning of 1976. Over half of the production of helicopters was exported to the USA. In Italy, A.109 helicopters were delivered to the traffic police and to the carabinieri. A lot of helicopters have been delivered to Africa and Asia. At the beginning of the 80's, the A.109 helicopter was modernized. The A.109K helicopter is a version for the army, designed to operate in a hot climate. The A.109K prototype was first flight made on March 1983. The A.109 X Mk II Widebody helicopter has an enlarged fuselage that is wider. The helicopter made its first flight in September 1984. The A.109 helicopter in the medical version was bought by the Air Ambulance Service in Warsaw. Helicopter A.109 No. 11630 received the registration SP-HXA and got the radio code Rescuer 12. It was in use from July 2, 2005. He was based at the Bemowo-Babice Airport. On November 20, 2009, this helicopter suffered an accident. The helicopter crew practiced emergency and autorotation landing. The permissible load on the rotor blades was exceeded, and as a result, the blade hit the helicopter's tail beam and its destruction. The crew did not suffer much damage. A.109A - The first production model, powered by two Allison Model 250-C20 turboshaft engines. It made its first flight on 4 August 1971. A.109A EOA - Military version for the Italian Army. A.109A Mk.II - 1975. Upgraded civilian version of the A.109A. A.109A Mk.II MAX - 1977. Medical version with the big doors. A.109B - Unbuilt military version. A.109C - Eight-seat civil version. A.109D - Builded one prototype only. A.109E Power - 1982. Upgraded civilian version, initially powered by two Turbomeca Arrius 2K1 engines. Later the manufacturer introduced an option for two Pratt & Whitney PW206C engines to be used. A.109K - 1983. Military version. 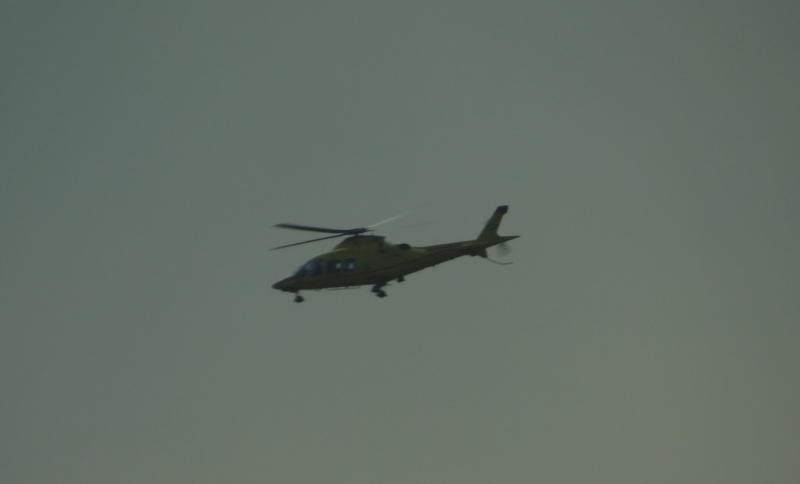 The first helicopters were delivered to the Carabinieri. The helicopter has a fixed chassis. AW.109 - With two engine Pratt & Whitney PW207. CA.109 - 2005. 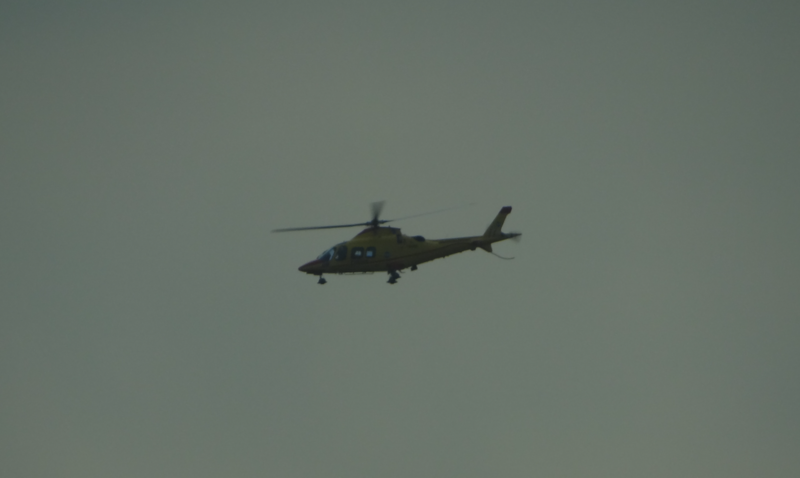 Chinese copy of the AW.109E for China market.